Think back just a few years with me for a minute. Remember that company that was the first to say that lighter and more aerodynamic drivers would be the way that amateur golfers would be able to gain more distance? This was at a time when it seemed like every other major OEM was busy putting out radical shaped driver heads that had us thinking we were going to just have to get over the awful look if we wanted to achieve longer and straighter drives. Here we are now with the 5th generation of their aerodynamic shaping and it just might be that Adams Golf had the right blueprint all along. So now that everyone is on the lighter and faster bandwagon let’s find out if Adams Golf still has the recipe for speed and distance with their latest driver; the Speedline F11. The distance of aerodynamics meets easy to hit. A new, larger footprint further increases forgiveness while Speedline’s Patent Pending Aerodynamic Shaping along with new Velocity Slot Technology on the crown and sole makes it faster than ever. The result is up to 12 yards of increased carry distance with easy to hit, confidence inspiring shaping. Larger footprint clubhead = Confidence inspiring appearance and expanded hitting area. Higher MOIx and MOIy = Higher ball speed on off-center hits. Lower and deeper Center of Gravity (CG) = Higher launch angle with lower spin rate. There are a few things that I particularly look at when doing a review on a driver. First I want distance; after all we don’t call drivers “the big stick” for nothing. We need distance! Secondly, I want forgiveness, let’s be honest, we’re usually swinging pretty close to as hard as we can with a driver so even the best of us need some forgiveness out of them. After distance and forgiveness I focus on how the club looks. I’ve tried some of the not so great looking radical shaped drivers out there and try as I might, I just can’t get over the looks. Lastly, you can put feel in there, but really feel is not something I look for first in a driver because if the distance and the forgiveness are there, the feel usually goes right along with it. These are not any different than what we all look for when picking out a driver but definitely the most important areas for me. The head shape of the Speedline F11 is pretty traditional, but that is about the last time you can expect me to use the word traditional in this review. I like the head shape quite a bit, it sets up very nice behind the ball and there is nothing distracting about it in the least. With this great shape I’d say that we’re getting off to a very good start so far. The big thing that stands out at address is the new Velocity Slot Technology you see on the crown, I’ll talk much more about Velocity Slot Technology a little later. Flipping the club over to check the looks from the sole the first thing you’ll notice, again, is the Velocity Slot Technology. Beyond that Adams Golf has chosen a very nice color scheme of a dark blue sole and a contrasting bright yellow Speedline across the bottom. The blue and yellow is complimented by a nice grey color as well. All in all it comes together very nicely for a great looking driver. There’s nothing real dramatic and wild from the graphics or the shape to distract you from what you’re really looking for out of this club, longer and straighter drives. Adams Golf has redesigned this version of the Speedline to be even more aerodynamic to give golfers an increase in their speed, but the F11 also has a higher MOIx and MOIy for more speed on off-center hits. I found this to be exactly the case with the Speedline F11 driver; I was able to get a fair amount of distance even when I didn’t have my best driver swing going. That is an improvement from a lot of drivers out there, sure they’re long when you pure one right on the button, but we don’t always hit that sweet spot dead center so having a high MOI to still get the ball down the fairway on a slight miss is a great advantage. Another thing the Speedline F11 seemed to really do well was give me a straighter ball than some of the drivers I’ve tried in 2011. I’m not saying everything was dead straight every time but definitely straighter than some drivers that promise tons of distance. The ball flight is something very important to me when talking drivers as well. I was happy with the mid to the occasional mid/high ball flight that the F11 provided. Rarely did I experience the distance killing balloon ball and I was very happy with how I was able to easily flight my ball lower when faced with a shot into the wind. The word that continues to come to mind as I recall my experience with this driver is consistency. It hardly ever did anything wildly unexpected and seems to just want to produce a nice straight mid launch ball shot after shot. I think many people were surprised at how long the Speedline F11 was when THP had this driver out at our annual THP Demo Day. I really felt like the ball was just jumping off the face of the driver quite nicely. And speaking of face, I love the deeper face of the F11 as well. I feel like this adds a nice element to the looks, forgiveness and distance of this club. Even on shots that I know I missed a little I was still treated with a nice ball flight and a solid amount of distance as well. This driver really rocks when you nail the sweet spot, the feeling of the ball just shooting off the face like a rocket is very addicting and I found myself constantly hitting “just 1 more” over and over again when testing this driver on the range. Earlier I mentioned the Velocity Slot Technology, which is the different looking step type thing going on both the crown and sole of the club. It might sound very distracting, but rest assured, it’s not. This is the new technology that Adams Golf has devoted a lot of time and energy into developing to reduce drag and help you swing the club even faster. 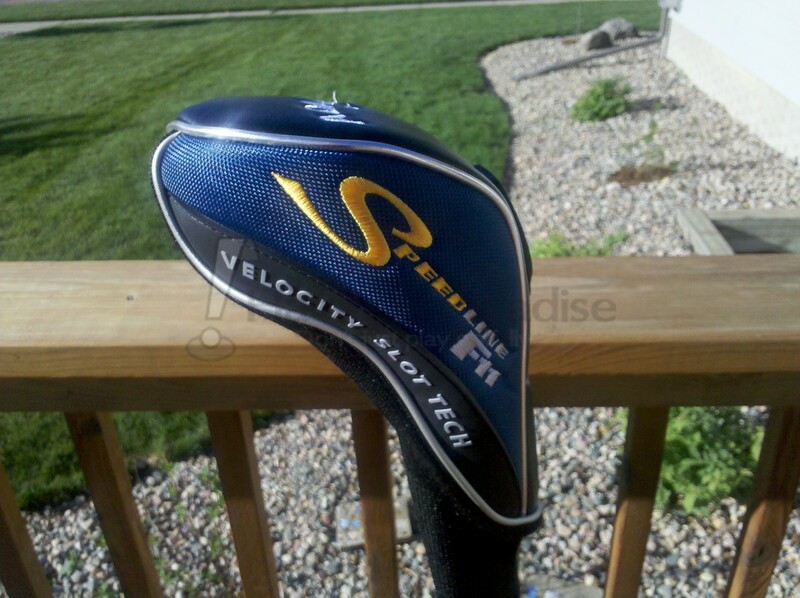 In studies Adams has found that clubs with Velocity Slot Technology are 35% more aerodynamic. I compared it side by side against several other 2011 drivers that are currently having themselves a very nice season both on the PGA Tour and with consumer sales figures, and the Speedline F11 stacks up very well. Many times balls with this driver would be right out there next to, and just as far as, balls hit by the other drivers. The length of the Speedline F11 driver is 45.875 inches, or just about ¾ of an inch shorter than one particular rival I tested it against. The Speedline F11 matched shot for shot quite nicely but one thing I noticed with the other that I just didn’t get from the Speedline was that next gear that would bump a ball up to 10 or so more yards further when hit directly on the money. Consistently long yes, the occasional drop your jaw distance, not quite. The Speedline F11 is available in lofts of 8.5, 9.5, 10.5 and 12.5 degrees. 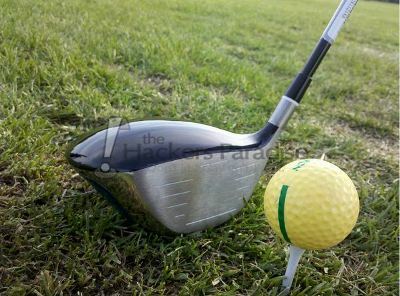 The head volume is 460cc and as stated the length of the club is 45.875 inches. The F11 I tested cam with an Aldila Voodoo SVS6 that really seemed to be a great shaft. 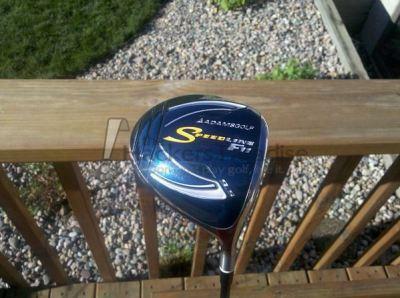 I really think the Voodoo shaft helped complete the total package of this driver quite nicely. The Speedline Fll is also available in a Matrix XCON for players seeking a higher launch angle. The grip is nothing fancy, a black Adams Velvet, but it worked just fine for me and I had no desire to change it. Lefties can get themselves a Speedline F11 in 9.5 and 10.5 degrees and for the slicers out there Adams Golf also has Speedline F11 Draw Drivers available. I still vividly remember thinking that Adams Golf was perhaps a little off base when they first started making the lighter, more aerodynamic and thus faster drivers a few years ago. It just seemed like we were headed in a more radically designed club head era for drivers but to their credit the folks at Adams Golf were spot on with that thinking. Everyone soon followed suit but it’s nice to know that Adams did not rest on their early innovations, instead they continue to improve on the Speedline model and I’m quite impressed with where they’re at with the latest Speedline F11 driver. The sound is not as loud and obnoxious as some drivers out there but it’s still a good solid sounding driver that really knocks the ball out there quite nicely. Consistency still comes to mind each time I look for another word to describe the Speedline F11 driver. Based on what we’re seeing in golfer’s bags at this point in 2011 I think you can also add underrated. This driver stacks up quite nicely to other ultra hyped clubs we’ve seen in 2011, I just hope more people give this thing a serious look when shopping for a new driver. The Adams Speedline F11 is available at golf shops everywhere for an MSRP of $299 and you can also find them at great online retailers such as www.Blind9Golf.com for even less. Another solid write up Jason! It really does sound like a win-win driver all the way around at an achievable price point. I liked the looks of this from the initial review and this makes me want to at least give on a go in the near future. Great review Jake! Looks like Adams Golf is really onto something with this technology. Makes you wonder if a more prominent OEM were to employ this technology would it be more popular? Good stuff buddy…. Great review Jason…Adams does a great job in their R&D department designing clubs that help out us normal players. Good work Jason. I have been a fan of the F11 series this season. I like hearing that the driver was such a good performer for you. Good write up. I have now seen a couple of heads that use a “velocity slot” or “compression channel” or the like. There must be something to the technology. The slot isn’t so good looking, but I do think the sole is done well. Glad to hear that it performed well for you, Jake. Consistent distance can be a good thing, especially when it’s combined with good accuracy. Great review Jason! I have never owned any Adams clubs, but of the stuff I have hit, I really like it. The technology behind the Velocity Slot Technology is very interesting to me. Great read Jake, sounds like Adams has another winner! Like you I thought the whole aerodynamic thing was a bunch of hooey, but these guys are proving it. While I am not in the market for a driver, after reading your review I would have to put this one on my list to try out. Great write up Jason! Great review Jake! I’ve heard a lot of mixed reviews about the F11 this year, but it’s nice to hear that it was forgiving and reasonably long. Great review. I have always thought Adams is underrated when it comes to their consistent performance. Great review Jason, thanks. A lot of good detail in there and it sounds like this is a very capable driver. Don’t see much of Adams over on these shores at the moment unfortunately. Great review buddy. This driver intrigues me quite a bit. Anytime I hear the word consistant with a driver, that usually leads to good things on the course. What a smokin’ hot review Jake! You rocked that like Dustin Hoffman does a box of toothpicks! Sounds to me like this driver deserves a spot in your bag based on that review. Well done pal! Great review Jake. At the beginning I thought you were going to go all the way back to the “tight lies”. Seems like this might be replacing the driver you (cough, cough) lost at the outing. Nice review Jake. Hopefully people will give Adams consideration when they’re looking for new clubs besides just hybrids. Great review Jake! I can’t say I’m a fan of the looks of the Speedline series, never have been. There’s just something about it that keeps me away. I think it’s about time I force myself to give this stick a try. Thanks for the good review. For the money this driver should be given a good look. What was the driver you tested against the F11? I am curious since the other driver had that next gear that was lacking in the F11. Nice review. Its not a brand I would have ever considered in drivers. Sounds like where Adams lacks in massive advertising and ultra-flashiness they more than make up for in forgiveness. Sounds like it has great distance too. Good review. I just have a hard time looking at it.I still would give it a shot. I already bought a one that was appealing and that didnt work out for the best…. 12yds longer than what???? They never quantify that… 12yds longer than a persimon driver from 1975 or 12yds longer than the previous Adams driver??? Nice review of the driver! I’ve actually hit this, and I really liked it. My roommate was hitting bombs with it. Great review. Personally I like the F11 – However it does not need to 45.875 inches in length – Too long. One question – Since when did making driver length longer and longer actually equate to an amateur (weekend hacker) hitting longer straighter drives on a consistent basis? This is a marketing ploy! Would it not benefit the weekend hacker more to take a few lessons from a good instructor. Improve technique, purchase a higher loft 10.5 to 12.5 driver that is slightly shorter in length, in the 43.5 to 44 inch range.. The shorter driver would provide more control for the hacker over a driver that is too long, 45 to 46.5 inches is too long for most amateur (weekend hackers) players to swing well consistently. Consistency is the key to better golf, or, I should say repeatability and consistency are two keys to better golf. Eldrick swings a driver that is 43.5 to 44 inches in length. You, the hacker, think you can swing a 46.5 inch driver consistently well. Probably not. I like to reply cyd2293 on why longer shaft is needed for regular flex. A soft hitter who uses regular flex shaft needs to compensate with a longer shaft for didtance and swing at slower speed. A hard hitter using a stiff flex shaft swing at higher speed so a shorter shaft would help in the timing. A longer regular shaft is wimpy to a hard hitter while a shorter stiff shaft is too rigid to a soft hitter. I have both F11 and Cleveland cl 290 ultra light shaft drivers. This principle applies to both drivers using this llight shaft technology advancement. Check this out yourself. I have this club in a regular flex voodoo with 10.5 loft right hand. Longest driver I have ever hit and it is hard not to hit it in the fairway. Very forgiving and goes a long way on slight mishits.